Now that the elections are successfully concluded, some of us would be on the lookout for where to escape from the hustle and bustle of the city. Somewhere you can kick back and relax and let the warmth of nature wash over you. Not to worry, there are uncountable destinations to relax and have fun in Nigeria. Agbokim Waterfall in Etung Local government area of Cross River state is one highly recommended destination for a relaxing vacation. It is not far away from the Nigerian-Cameroun border and it is just 17 kilometers from Calabar. You don't even need to worry about driving to Calabar because an airport is domiciled in Calabar which is the Margaret Ekpo International airport. Furthermore, Cross River is widely known for her tourism potentials as it is home to the Calabar Carnival, Tinapa Resort, Obudu Cattle Ranch and of course the Agbokim Waterfalls amongst many other tourist sites in the state. The state is also reputed to be one of the cleanest states in Nigeria. Therefore, rather than travelling to Dubai, London, Paris, and New York for your vacation, you can visit Calabar to experience the fall where you can wine and dine with family and friends at very affordable prices. There are also exquisite hotels where visitor can lounge. Why then is Agbokim Waterfall a place to visit? It may be argued that Agbokim offers visitors and tourists an overwhelming feeling of heaven on earth. The luxuriant green landscape, the splendor of the eight falls cascading down and the charming ambience gives visitors peace of mind and warmth. The fall is quite inviting and without doubt nature's gift to humanity. The feeling can best be described as celestial. Dotting the Agbokim Waterfall are different relaxation spots and rest houses. They all are available for patronage. These spots offer various local and international cuisines, brief naps, hotel and taxi services to the satisfaction of the tourists. Children are not left out of the fun as there are various services that also satisfy their needs too. 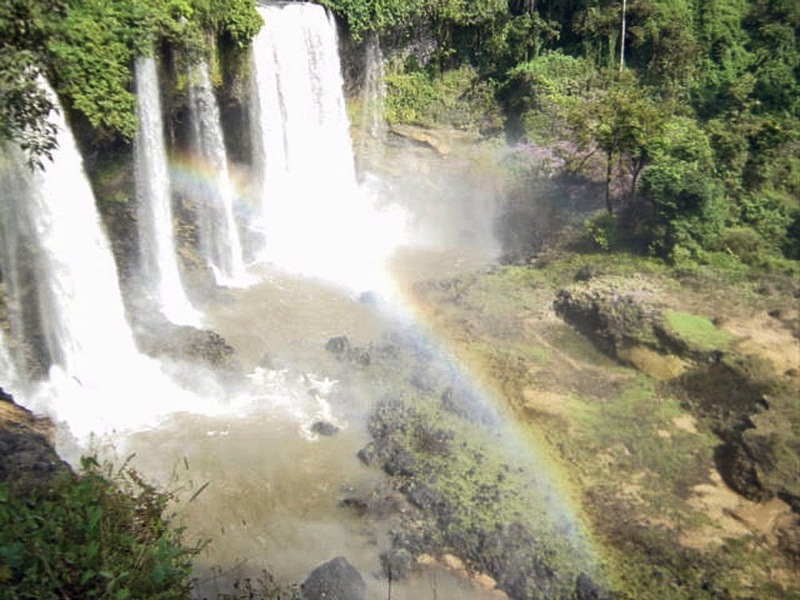 So, why not save money by visiting Agbokim Waterfall in Calabar? It is an awesome spot for picnic and other leisure gatherings or vacations. This mindblowing tourist sites can be visited at anytime of the year. But it is advisable to visit there in December when the Carnival Calabar is often held. At that time, Calabar would be at the peak of activities. And Agbokim is not left out of these activies as the carnival would rub-off on the fall because tourists would like to visit the fall after the thrills and frils of Carnival Calabar. You can now pick your box; hop on the next flight and on to Calabar to have a quiet and cool time at Agbokim Waterfalls. You can also go with family, friend or a loved one. You will never regret your decision!